After we said our goodbyes to the cousins we left Okemos, picked up Interstate 69, and headed west to Port Huron. Our driving plan was to cross into Canada for the fifth time on the trip. I hoped they didn’t keep records of all the crossings or they might wonder what we are up to. Highways 3, 1, 405 and the QEW (Queen Elizabeth Way) brought us to one of our favorite campgrounds in Confederation Park, just outside of Burlington, Ontario. We had stayed in this park on previous trips on our way home. This neat park on Lake Ontario has a lot of space and is not generally overcrowded, especially during the week. It has some very nice walking paths along the lakeshore. The only negative is the overpopulation of Canadian Geese that frequent the campground. The rangers try to keep them under control by frequent drive-throughs to chase them away. It was quite windy this evening but the threatening rain stayed away. Back across the border and into New York, the New York State Thruway carried us most of the 300 miles back home to our home on Pumpkin Hook in Van Hornesville. It was nice to see “Home Sweet Home” again. We think this section of our great country is some of the prettiest there is. The lawn has been mowed as planned and looks pretty good but there are weeds where I don’t normally let them grow. Oh well, something for me to do. Our RV now has 9,500 more miles on it. Another great and memorable trip. 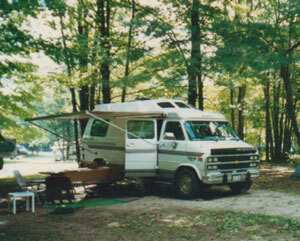 We started our westward journey in our RV on June 2, 1998. Over the next 12 weeks we were in fifteen states and three Canadian provinces. We visited eight National Parks, three National Monuments (including Mt. St. Helens), two National Lakeshores and a portion of the Oregon Trail National Historic Site where original wagon wheel ruts could be seen. We were at the geographical center of North America in Rugby, ND. We crossed the Continental Divide and the Laurentian Divide. We logged 9,500 miles on our RV and another 1,200 on the 2-week portion of the trip when we joined up with the SUNY Oneonta geology group to explore Washington and Oregon. Thank you for staying with us and sharing the weekly recap of this special trip. Now it is time to take another little vacation. The Richardsons reside on Pumpkin Hook, Van Hornesville.